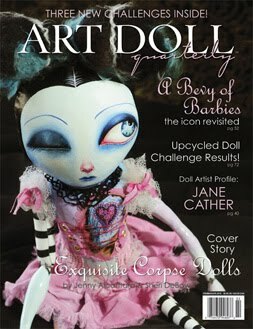 Art Doll Quarterly shares dolls and sculptural figures made from fabric, clay, wire, paper, and more. 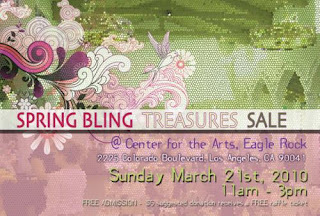 Spring Bling Treasures Sale this Sunday! My dear friend Renee Dominique is hosting another amazing boutique fundraiser at The Center for the Arts, Eagle Rock! Did ya know that I designed the invitation for the event? Yep, I do the graphic design stuff too! I love creating things for non-profit orgs that do such good for the community! I'll have a table (along with my mom & fellow artist Linda Johnstone Allen). I'll be selling books, prints, and paintings and she'll be showcasing a bunch of organic and gorgeous ceramic pieces! Tell your friends! Come check this event out! A trunk show of local artists will open their treasure boxes to share their unique creations- one day only. Welcome Spring and join us for an afternoon of shopping! See Jewelry, Accessories, Ceramics, and other fine wares available for purchase directly from the artists. 10% of all sales benefit the Center for the Arts, Eagle Rock, a non-profit arts programming organization dedicated to providing innovative and multicultural arts programming to the communities of Northeast Los Angeles. 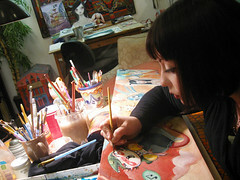 Just working on some new paintings this March for some upcoming shows in Santa Fe in May, and Culver City in September. This one will be a triptych (3-panels attached with hinges). One of my favorite time periods of art history was the emergence of the use of Triptychs in religious art during the end of the Middle Ages and onward into the Byzantine era. Something about the narrative and exquisite detail - just blows my mind! My art making this year is going to focus on letting go, experimentation and creating pieces that just flow and feel good. I'll keep you posted with my progress. 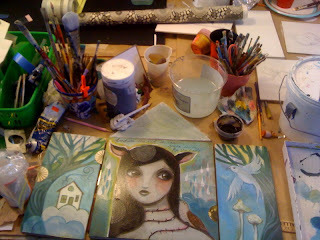 And if you want a sneak peek, stop by my open studio in April (more info to come). 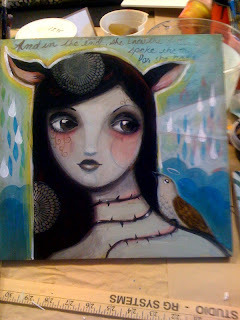 Just uploaded photos of our "art jam" collaboration piece! 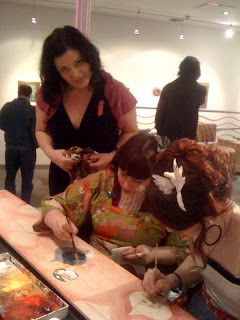 We've been working on it for about a month now ( we being artists - Jeni Yang, Su Moon, Miss Mindy (pictured), Dee Chavez, Celene and myself (CJ Metzger). It's coming along nicely, and we are adding the last details this week - then it's off to auction! The piece will be sold through an auction through WWA gallery - in Culver City and the proceeds will Benefit the Lunch Bunch Charity of Los Angeles (amazing group feeding the areas homeless). Things to Come - New Work! 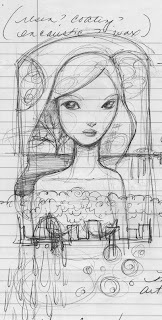 Last night I sat in bed and just sketched in my notebook. Funny, some of my best drawings have been scribbled on lined paper! SOmething about the fancy journals with their nice paper that intimidates me... the lined paper is a comfort - takes me back to the early days of art making. Scribbling into school notebooks during and in between classes, embellishing every square inch of a text books brown paper cover. Talk about freedom with creativity. This year I'm making a pact with myself to experiment more, judge myself less, and just be free with my creativity and the whole process. I'm looking forward to seeing what comes out! Trappings Show - Opening Reception Jan 15th! 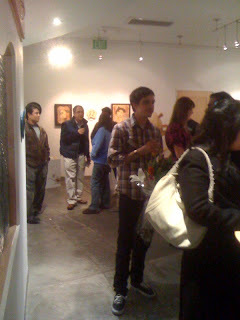 The Trapping Show reception at the WWA gallery was a fantastic success! 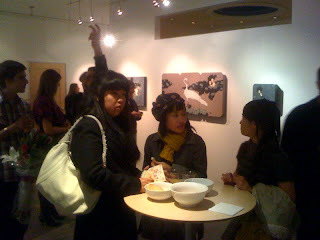 Art sold, and the venue was packed to the brim with art-goers and friends! The show came together lovely, and was hung beautifully by Rob Faucette & the WWA gallery crew. 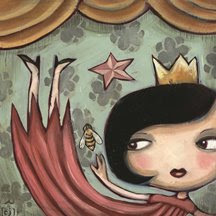 I urge you to swing on by to see the show, being in the heart of Culver City - there are a bunch of great places to nab a bite to eat, then stop in for a bit o' art viewing. Artists Jeni Yang, Celene, me (CJ Metzger), Miss Mindy, Su Moon, and Dee Chavez were all on hand to do a bit of "on-site" painting for a good cause! Proceeds from the auction of our collaborative piece will benefit the Lunch Bunch, a super local organization that helps feed Los Angeles Area Homeless. check back for photos of this amazing collaborative piece - as it progresses during the month of January! Ahhh....Sometimes you just need to be outdoors! And Yosemite is by far the best place to get that "out of doors" awe-struck- humbling experience that just puts everything in perspective. It is so magical and such a special place to me and my family. I've been trekking there since I was just a wee little babe. In fact, my mom toted me in a baby carrier to Vernal falls when I was around 9 months old! 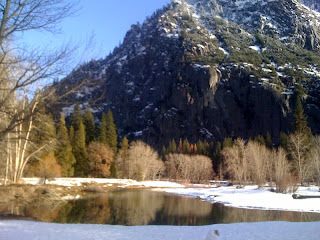 My family and I spent the New Years Holiday up there and braved the winter (mild, but we did get some snow!). Above are a few pic's i snapped from my iPhone. You just can't take a bad photo of that place. I was hoping to paint a little, and did some sketching, but moreover - I just needed to refresh my mind and let nature make it's visual imprint on me. 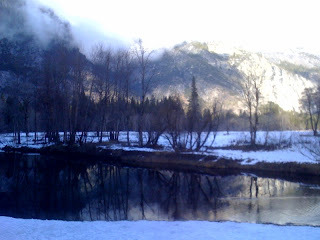 It was nice to just be little ol' me, quiet, breathing cool air, kicking stones, eating snow. I'll get to painting as soon as I get back home. please visit cj's website for all current exhibitions, and other upcoming events and news. 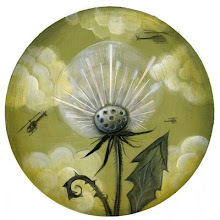 CJ Metzger is excited to announce she has open edition prints available through the PODgallery. Based in New York, this print publisher has its inventory online and offers prints on paper and canvas! Check out the site! I'm a Los Angeles based artist, designer, entrepreneur and mom. I create paintings for your walls, illustrations for books and publications, write stories for all ages, and create works of graphic design that have been described as whimsical, insightful, and surreal. Take a peek at what I'm up to! And there's tons more at my website - www.cjmetzger.com!